A father said his life has been changed after being partially blinded by an attack by bikers connected to Hell’s Angels outside a Hastings pub. The man in his 50s, who wished to remain anonymous, was assaulted by a group of men outside the Carlisle pub on Pelham Crescent in February. The father-of-two says he has lost all independence and could not understand why he was attacked. “What they did to me was way over the top, it was like they were deliberately trying to blind me, the hospitals had never seen anything like it,” he told the Observer. “These people are thugs. The ferocity of the attack didn’t warrant whatever I had done. “I’ve been focusing on getting my sight back and being positive about it, but I have to rely on people for everything, it’s really upsetting. The victim was headbutted and knocked out during the attack outside the pub at around midnight. The man has had multiple operations to save his eyesight after the attack. He was completely blinded after the attackers targeted his eyes and head, but the operations by eye specialists at Sussex County Hospital Brighton have meant he now has blurred vision in his left eye and some vision in his right. Regardless he cannot drive, walk his dog, take his children out or work. He said he has had to re-learn how to make a cup of tea. The father is hopeful his vision will return one day but nothing is certain. For now he relies on a walking stick and the disability settings on his phone. Police want to speak to the Sussex chapter president of the Hell’s Angels over the attack, after previously arresting and bailing a man. “I do want people to come forward and provide evidence as this has happened to me watching a band at the pub, it could have happened to anyone and quite easily killed me,” the victim said. 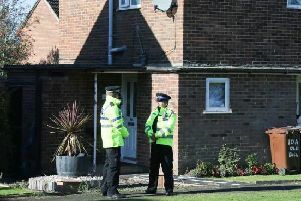 Anyone with any information should call police on 101 or email 101@sussex.pnn.police.uk, quoting Operation Nuneaton. Alternatively you can contact Crimestoppers anonymously on 0800 555 111 or visit www.crimestoppers-uk.org.